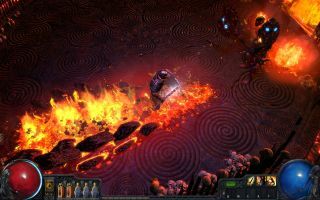 Grinding Gear Games has announced that The Awakening, the hefty expansion to the 2013 action-RPG Path of Exile, will be released on July 10. The Awakening will serve as the fourth act to the game's story, featuring new areas, monsters, and end-game maps that enable players to explore beyond the realm of Highgate. The expansion will also add "legendary" new bosses to defeat, powerful skill gems, a "socketable passive tree" that can be modified through the addition of jewels, more than 110 new Unique items, and a new equipment set called the Maraketh Weapons. The interface has also been upgraded, with more customization options and various changes suggested by the Path of Exile community. All of that will probably have those of you who have actually played Path of Exile nodding your heads furiously. For the rest of us, there's the Path of Exile: The Awakening trailer above to help clarify things a bit, and we've got a closer look at what's coming in the expansion here. And since I'm piling on the reading, don't miss our review from January of last year, in which we declared Path of Exile (minus The Awakening part) to be "an exceptionally generous free-to-play action-RPG."